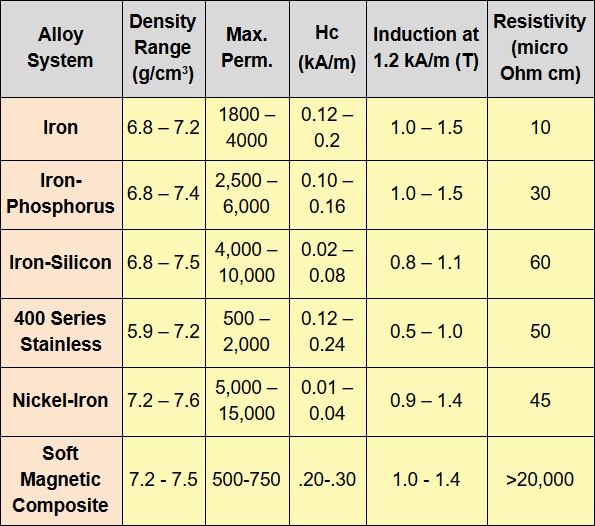 CHARTS: Properties of Powder Metallurgy Magnetic Materials. Why are magnetic materials important? Without magnetics, modern technology wouldn’t exist. They’re in motors, transformers, cars, and so on. And powder metallurgy materials are often the best way to deliver the key magnetic properties that literally drive these applications. The following charts and points give you a taste of the properties of various magnetic materials, including competing materials. Why Do Powder Metallurgy Materials Need to Be Magnetic? They can also be ferrites or iron oxide compounds. For more detailed information on different metals used in powder metallurgy, scroll below. All of these materials are characterized by high permeability. This quality is great for applications in which you need lightning-fast response to an applied current. 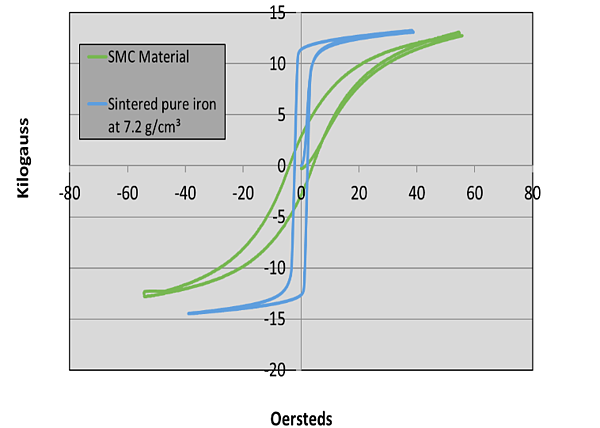 The chart above gives you a good idea what to expect with sintered powder metal materials. “Induction” refers to magnetic induction, aka magnetic flux or flux density. These terms refer to the process in which a material is magnetized by an external magnetic field. Sometimes you need some strength to compliment the magnetic properties of your device. The table below shows a comparison of two powder metal alternatives to a common steel used in electrical applications. 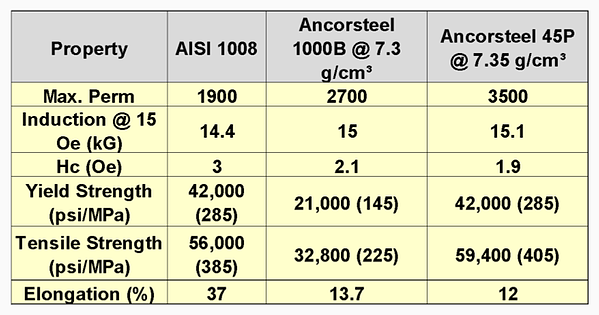 AISI 1008 is a common carbon steel. Ancorsteel 45P is a grade of powder metal that contains 0.45% phosphorous or ferrophosphorus. The 1000B is pure iron. Think of 1000B as your base material for DC applications. The 45P is more advanced, though still less advanced than, say, a 3% silicon material. These two are also geared toward DC applications. The SMC 700 1P, 3P, and 5P soft magnetic materials you see here are all specialized for AC applications. Whatever your magnetic application, the name of the game is good magnetic performance that still balances mechanical performance. Stainless steels used in powder metallurgy are mainly ferritic grades mainly used in corrosive environments. Martensitic stainless grades 409L and 434L are widely used in magnetic sensor applications where corrosion resistance is important. Stainless steel generally has lower induction than iron or iron-phosphorus systems. Iron-nickel pre-alloyed materials are 50% nickel and 50% iron. Expect high permeability and a rapid motion with low coercive force -- think of the old dot matrix printers. Low induction and low applied fields are trademarks of iron-nickel. Because of the high nickel content of this alloy, the cost is high. Iron-phosphorus materials feature high induction, strength, and hardness. Its resistivity is merely so-so. It’s notable that this alloy’s ductility allows for riveting operations. Iron-silicon sintered parts respond better than iron-phosphorus sintered parts at moderate frequencies. This powder material is used in actuators where impact is involved, such as impact printer heads. “Soft” in this case refers solely to the magnetism and has nothing to do with the material’s strength or hardness. Hard magnetic materials see popular use in electric motors. Wait, What Is a Soft Magnetic Composite? The three most frequently used grades by top powder metal parts manufacturers are the 1P, 3P, and 5P materials mentioned above. Other grades of soft magnetic composite are available for higher-frequency applications. Since these are advanced materials, consult with Horizon for the nitty-gritty details. This B-H curve chart shows the performance of soft magnetic composite versus a frequent competitor, laminations. The chart shows the relationship between magnetic flux density (B) and magnetic field strength (H) for a particular material. Bs is measured in teslas. These are key values that engineers and purchasers should look at when choosing magnetic materials. It’s all about the magnetic response as you apply a field and remove a field. It’s truly helpful stuff for purchasers looking to get on the same page as their parts supplier. And if it’s all too confusing, just ask for help! So, What Else Can You Do With This Stuff? Sintered powder metal can provide a range of magnetic properties. Secondary processing can influence permeability and coercive force. Disclaimer: Soft magnetic composites, while generally amazing, are not sintered. As such, they are brittle and are not recommended for rotating components. We’ve exhaustively covered all the good stuff soft magnetic composites can do here. Need More Information? Expertise? Confusing Charts? Get in touch with us if you need further explanation into any type of powder metal material. There’s a reason we have a world-leading materials consultant on staff!